As a koi owner, it is crucial that you keep your koi's tank or pond at a reasonable temperature. Koi rely on the water temperature to assist with their digestive process and cannot digest food if the water gets too cold. 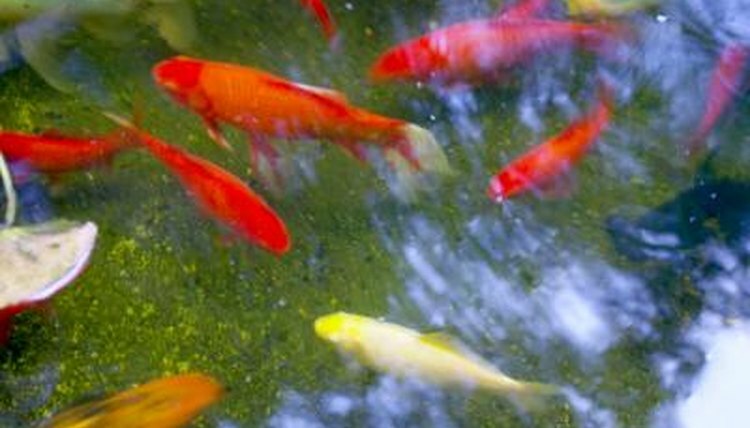 Failure to keep your koi's water within the acceptable temperature range can lead to the death of your fish. According to Koi Acres, a company that sells koi and koi supplies, koi fish are able to survive in water that is anywhere between 34 and 90 degrees Fahrenheit. Even though koi can survive in extremely cold or very hot water, it does not mean that they do well at these temperatures. This is especially true if the extreme temperatures persist for long periods of time. Koi tend to do well when their water is around 65 degrees or slightly higher. Your koi's internal systems begin to slow down when water temperatures reach 65 degrees and continue to slow as temperatures continue to drop. When the temperatures in your koi pond or tank are between 52 and 60 degrees Fahrenheit, you will want to feed your koi an easy to digest food such as one made of wheat germ. You need to change his diet because his digestive system will not be moving very well. If food gets trapped in the digestive system as temperatures continue to drop, it can rot there and cause the death of your koi. Once the temperature drops below 52 degrees, your koi cannot digest and you should not feed them. You cannot feed your koi after temperatures drop below 52 degrees and, in the winter, you do not want to feed your fish again until spring even if the temperatures come back up. Frequent changes in water temperature can cause real problems for your koi as their systems try to adapt to whatever temperature the water is currently at. Some individuals choose to put water heaters in their koi ponds or tanks and regulate the temperature though artificial means. Regardless of whether you choose to try and regulate the water temperature, you need to have a thermometer in your tank at all times so that you know what temperature the water is and can make changes to your care program accordingly. If your koi live outside during the winter, you cannot allow your koi pond to freeze over. You must have a hole in the ice that allows fresh air to travel in and out of the water. How Often Should I Feed Cold-Water Fish? Why Do Fish Stay on One Side of the Aquarium?